Tracey and Jana opened D’Tails in 1999, and have been working together since 1990. Their mutual love for animals and years of experience grooming has created the ideal environment and a wonderful team here at D’Tails. 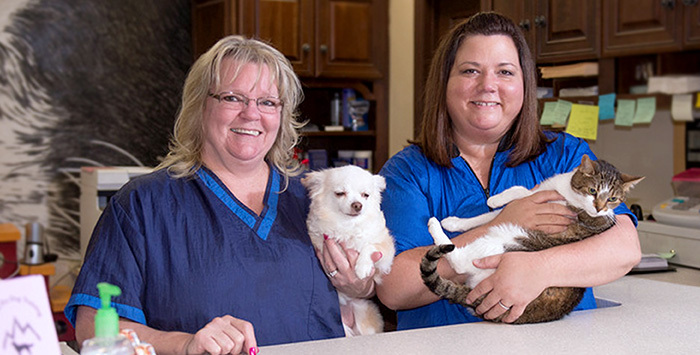 They have carefully selected a wonderful staff that cares for your pet as they would, and wouldn’t have it any other way! They would love for you to come meet their team. D’Tails offers a full array of boarding and playdate options for your pets. Our open range policy provides our four-legged friends with a welcoming environment to socialize with other fur babies. With beds throughout our facility, there’s always a comfortable corner for them to rest. Your baby will have the opportunity to run and play, indoor and out, going home content and happy. Does your cat or dog need regular medication? No problem. D’Tails can take care of any special medical need free of charge as part of our services. Our goal is to make sure your pets enjoy their “home away from home”. We love it when they come bounding in the front door! With more than 35 years of experience, you can trust that at D’Tails your best friends will be in good hands – or paws! Take a look below for more information on our pricing options and services. To make arrangements for a stay or for more information, email D’Tails at dtailsgrooming@gmail.com, or give them a call at 706-731-0089. Jana has been professionally grooming since 1978, and truly loves this business. With skills established over years of being in business, she has a wonderful understanding of what is important to her customers, both as a groomer and pet owner. Tracey has been a professional groomer since 1990. She has a wonderful understanding and patience for the dog on her table. For over 24 years she has established and maintained a practice centered on all breed haircuts and really enjoys her work.